Home/Archive by Category "Weekly Market Update"
There were lots of headlines over the last week about the IMF downgrading its global growth forecasts to 3.3% for this year from 3.5% – but it’s really just catching up to last year’s growth slowdown which was reflected in last year’s share market falls. So, while the IMF headlines caused a one-day blip in markets its nothing new. Particularly with central banks already having swung back to being dovish and signs emerging that global growth may be bottoming and starting to improve. 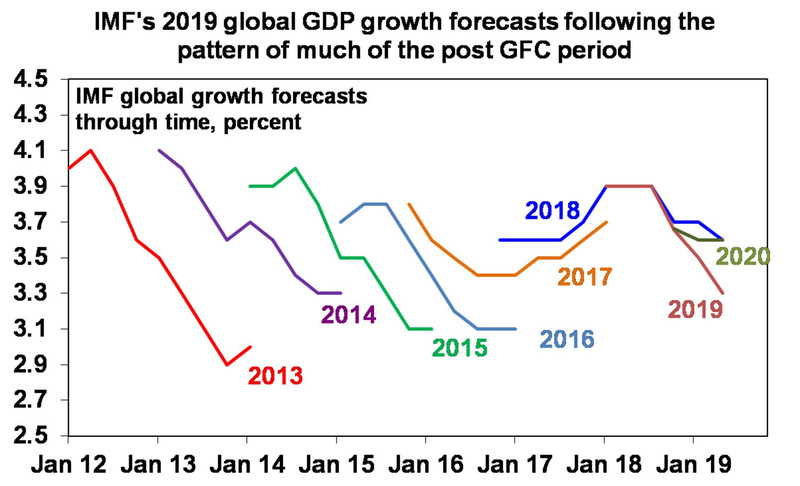 But from a big picture sense the return to a downgrade cycle for global growth forecasts after a year or so of upgrades around 2017 provides a reminder that we are still in the constrained growth/low inflation/low rate world that we have been in since the GFC. Is a US/European trade war going to take over where the US/China one left off? This issue reared its head again over the last week as progress continues to be made in resolving US/China trade tensions and the US threatened tariffs on US$11bn worth of imports from the EU in retaliation to the EU subsidies of Airbus. And of course, President Trump has to resolve by mid-May whether he will impose tariffs on auto imports from the EU. However, beyond a lot of noise a US trade war with the EU is unlikely. First, the Airbus issue is occurring in the context of a WTO dispute that’s been going for years so it’s not Trump going out on his own. Second, the proposed tariffs on $11bn of imports from the EU is small versus the $360bn of imports from China. Third, it looks designed to get the EU moving on trade talks. Fourth, there is little support for a trade war with the EU amongst the US public or Congress (unlike v China) and the US trade deficit with the EU is small compared to that with China anyway. Finally, another trade war would pose a new threat to Trump’s 2020 re-election. That said the trade issue with EU could go on for a bit and so cause a bit of volatility. But it’s unlikely to be anything like that seen with the US/China trade dispute. The great central bank retreat to dovishness continues. The minutes from the Fed’s last meeting are consistent with it remaining on hold and bringing quantitative tightening to a tapered end this year. And at its meeting in the last week the European Central Bank was dovish, formally considering making its negative interest rate on bank deposits less onerous for the banks and with President Draghi erring on the side of doing more rather than less to stimulate growth. With Chinese monetary policy remaining easy it’s clear that one of the big concerns for markets last year ie that central bank policy would be too tight remains in retreat for now. The start of the Australian Federal election campaign ahead of the May 18 election has ushered in a period of economic policy uncertainty for investors. Elections normally see a bit of market nervousness but with a Labor Government promising a very different approach to economic policy than the Coalition involving higher taxes, larger government and more intervention in the economy the May election presents a starker choice than has been the case since elections back in the 1970s and so suggests greater uncertainty for investors than normal around elections. Meanwhile in Australia, bank funding costs have continued to fall. Bond yields have collapsed driving down the funding cost for fixed rate mortgages, the interest rates on which the banks are now cutting again. And the gap between the bank bill rate and the expected RBA cash rate has now fallen back to around its longer term average of around 0.23% cutting the funding costs for variable rate mortgages and pointing to a reversal of the 0.1 to 0.15% mortgage rate hikes the banks put through last year or at the very least it indicates that they have little excuse not to pass on any RBA rate cuts in full. Chinese CPI inflation rose in March to 2.3%yoy, but core inflation remained low 1.8%yoy. Underlying inflation pressure is low and won’t constrain policy stimulus. Australian economic data was mixed with a modest rise in consumer sentiment and a bounce in housing finance after several months of falls but another fall in job advertisements. The RBA’s latest Financial Stability Review highlighted the risks around global growth, high household debt, the housing slowdown and bank culture but seemed reasonably confident that the financial system will weather these risks. In particular it noted improved lending standards, stress tests indicating banks have sufficient capital to withstand a 30% or greater fall in house prices and that even in WA where house prices have fallen nearly 20% and unemployment has increased by 3%, mortgage arrears remain relatively low. Overall, the Review looks to be consistent with the RBA’s neutral bias on interest rates for now. Are prospects for rate cuts fading? Somewhat better economic data lately, tax cuts for low and middle income earners regardless of who wins the election and ongoing RBA optimism about the economy picking up have seen rate cut expectations fade a little bit. However, while this could see the first rate cut pushed back out a bit, it is still likely that the RBA cutting rates twice this year as the housing downturn dampens economic growth and keeps inflation below target for longer. In the US, the highlight is likely to be a bounce back in March retail sales (due Thursday) after a soft patch seen late last year. In other data expect to see modest growth in March industrial production and a solid reading for the NAHB’s April home builders’ conditions index (both Tuesday), a slight deterioration in the trade deficit (Wednesday), continued solid readings for April business conditions PMIs (Thursday) and a bounce back in housing starts (Friday). The flow of US March quarter earnings reports will start to pick up. The consensus expectation is for a 2% decline in earnings per share on a year ago as last year’s tax cut drops out and reflecting slower economic growth. 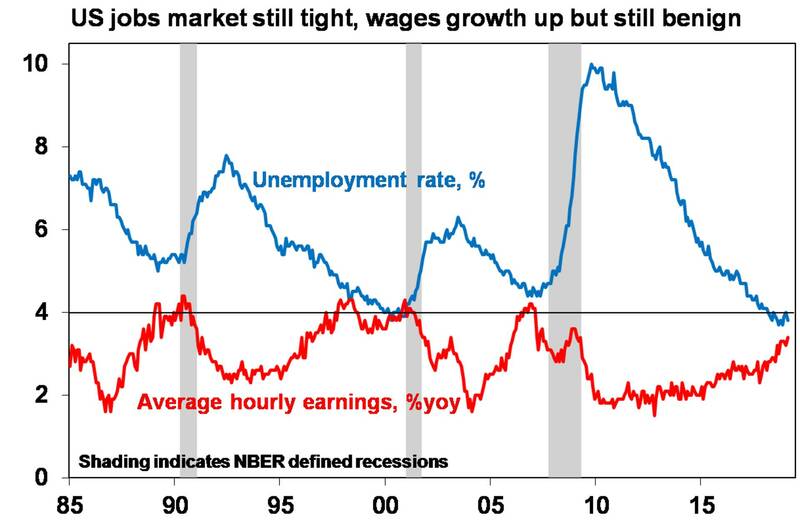 But given the sharp downgrade to expectations seen in recent months there is a good chance we will see greater than normal earnings beats suggesting that actual earnings growth will come in around flat or up slightly. Either way it’s likely that the March quarter will be the low point for earnings growth this year. Eurozone business conditions PMIs (Thursday) will be watched for more signs of stabilisation. Japanese inflation data (Friday) is likely to show that core inflation remained weak at 0.4% year on year in March. Chinese economic activity data due Wednesday is likely to confirm a further slowing in GDP growth, but also show that momentum is likely to improve a bit going forward. March quarter GDP growth (Wednesday) is likely to show a further slowdown to 6.3% year on year from 6.4% in the December quarter, with quarterly growth slowing to 1.4% from 1.5%. However, consistent with recent stimulus and a lessening of trade war fears, March activity data is expected to show a pick up in momentum with growth in retail sales accelerating to 8.4% year on year, industrial production accelerating to 5.9% growth and investment growth picking up slightly to 6.3%. In Australia, the minutes from the last RBA’s board meeting (Tuesday) are expected to show that the RBA’s neutral bias on future interest rate moves remains in place. Meanwhile, March jobs data (Thursday) is expected to show a 10,000 gain in employment and a rise in unemployment back to 5%. Share markets – globally and in Australia – have run hard and fast from their December lows and are vulnerable to a short-term pullback. But valuations are okay, global growth is expected to improve into the second half of the year, monetary and fiscal policy has become more supportive of markets and the trade war threat is receding all of which should support decent gains for share markets through 2019 as a whole. Low yields are likely to see low returns from bonds, but government bonds continue to provide an excellent portfolio diversifier. Expect Australian bonds to outperform global bonds. Unlisted commercial property and infrastructure are likely to see a slowing in returns over the year ahead. This is particularly the case for Australian retail property. However, lower for even longer bond yields will help underpin unlisted asset valuations. 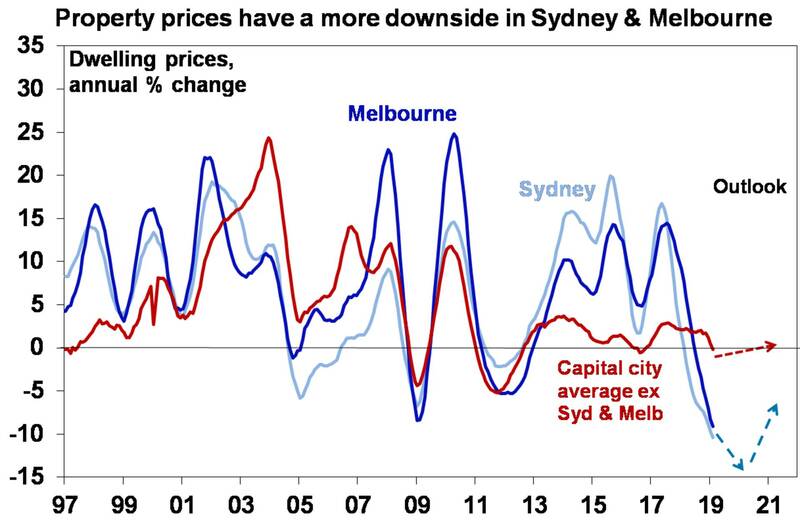 National capital city house prices are expected to fall another 5-10% into 2020 led by Sydney and Melbourne on the back of tight credit, rising supply, reduced foreign demand, price falls feeding on themselves and uncertainty around the impact of tax changes under a Labor Government. The A$ is likely to fall into the US$0.60s as the gap between the RBA’s cash rate and the US Fed Funds rate will likely push further into negative territory as the RBA moves to cut rates. Global share markets fell slightly over the last week on global growth concerns and renewed US/Europe trade war fears. Australian shares rose though playing catch up to the previous week’s rally in global shares with energy, tech and real estate stocks being the main drivers. Bond yields were flat in the US but fell elsewhere. Oil and iron ore prices continued to push higher with supply issues supporting both. The US$ fell slightly and this saw the A$ rise slightly. US economic data was confusing but on balance strong. While job openings fell in February since then payrolls have rebounded and unemployment claims have collapsed to a post October 1969 low suggesting that job openings and hirings will rebound again. Small business optimism rose slightly in March and remains solid. Meanwhile core inflation was weaker than expected in March. 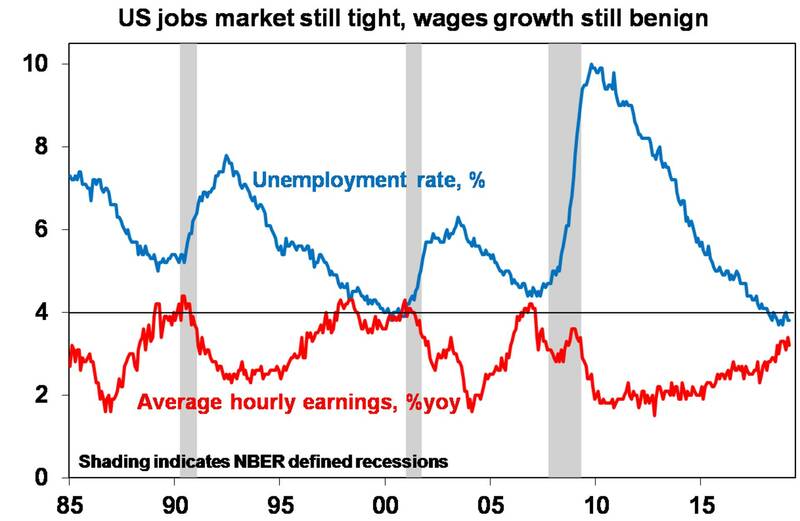 Which is of course partly why the Fed can remain on hold for now but with the labour market remaining very tight and energy costs pushing back up it’s hard to see them cutting rates any time soon. Which could mean that the next big move in US bond yields will be up (not down). Global share markets pushed higher over the last week helped by more “green shoots” pointing to improving global growth this year, including Chinese business conditions PMIs and the US ISM index and a stabilisation in Eurozone composite PMIs, another Goldilocks jobs report in the US and more indications that the US and China are getting closer to a deal on trade (albeit with issues around enforcement and the removal of last year’s tariff hikes yet to be agreed). For the week, US shares rose 2.1%, Eurozone shares gained 3.1%, Japanese shares rose 2.8% and Chinese shares rose 4.9%. After an initial rally to a six month high, helped by the positive global lead and some Budget stimulus, the Australian share market gave up all its gains, not helped by election uncertainty to end the week flat. Reflecting the global risk on tone bond yields rose. While the copper price fell, oil rose as did iron ore helped by a new (cyclone-related) supply disruption. The US dollar was little changed as was the A$. The Brexit comedy continues. The UK got no closer to agreeing a Brexit plan, PM May is requesting a short extension to 30 June, however the EU may push for a longer extension to allow time for a deal to be agreed. A long extension raises all sorts of issues around the UK being forced to participate in EU elections in May, new UK elections and another referendum. But remember Brexit is merely a sideshow for global investors. 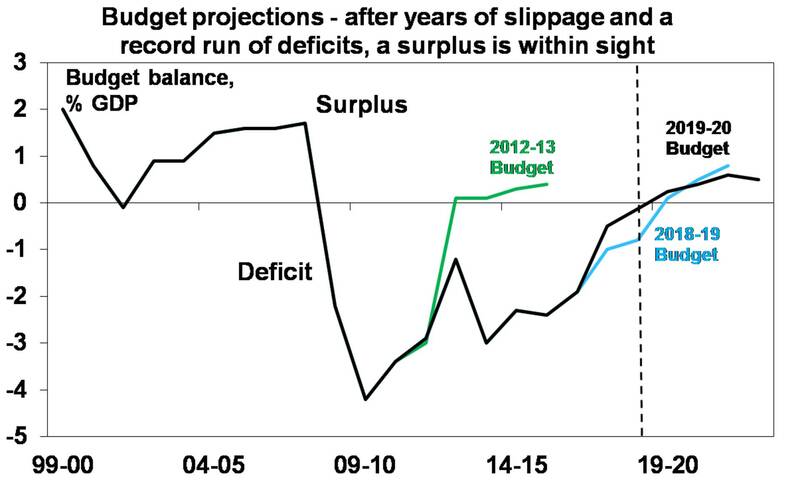 The 2019-20 Australian Federal Budget gets back to surplus but is an election budget and so fails to really excite. To be sure, this budget contained good news with help for low to middle income households, an enhanced plan for reducing taxes next decade (or giving back fiscal drag to be precise), more tax cuts for small business and a further uplift in infrastructure spending, all with a return to surplus after 11 years in deficit. After several years of being wide off the mark, budget projections since the 2015-16 Budget have been pretty consistent in terms of their surplus timing and we are now there (well at least we will be in a few months). Against this though, the immediate boost to low-to-middle income households is relatively modest and views remain that the Government’s GDP growth and wages’ forecasts are on the optimistic side. In terms of the election, Opposition leader Bill Shorten’s Budget reply speech confirmed that a Labor Government will adopt a very different approach to economic policy. The key elements of this include supporting the Government’s immediate “tax cuts” for middle income earners and increasing them for low income earners, but increasing (not decreasing) tax rates for higher income earners, restricting negative gearing, halving the capital gains tax discount, ending cash refunds for franking credits, a more aggressive climate policy, higher minimum wages with some labour market re-regulation and more spending on health and education. As always, much of this will be dependent on Senate passage and that’s not assured in some areas (like negative gearing). But it will likely lead to nervousness in the Australian share market and the changes to negative gearing and capital gains tax will be negative for property prices. If Labor wins, expect a mini-budget in the September quarter. But it’s clear that both sides of politics are aiming for budget surpluses and committed to tax relief for low and middle income households to be received after they complete their 2018-19 tax returns. The latter will provide some boost to spending in the September quarter (although the Rudd payments in the GFC indicate that much will be saved) which along with likely RBA rate cuts, continuing strong infrastructure spending, improving business investment and strong export demand should keep the economy growing despite the drag from the housing downturn. US data was mostly encouraging. On the downside, underlying capital goods orders and retail sales fell in February. But the level of capital goods orders remains high, retail sales for January were revised up, construction spending and auto sales were strong, payroll employment rose solidly in March, jobless claims fell to a new post-1969 low and business conditions ISMs and PMIs are solid and consistent with reasonable growth. March jobs data confirmed that “Goldilocks” (not too hot, not too cold) is alive and well in the US, with a strong gain in new payrolls of 196,000, three month average jobs growth running at 180,000, unemployment remaining very low at 3.8%, labour underutilisation also remaining very low at 7.3% and yet wages growth staying benign at 3.2% year-on-year. So the Fed can and will remain on hold. The Eurozone’s composite business conditions PMI fell slightly, but it is showing tentative signs of stabilising. Meanwhile, unemployment held steady at 7.8% in February but with core inflation falling to 0.8% year-on-year in March, pressure remains on the ECB to boost growth. Japan’s March quarter Tankan survey showed a deterioration in business conditions for manufacturers (albeit from relatively high levels) but conditions for non-manufacturers remain strong. Chinese business conditions PMIs rose in March adding to signs that Chinese growth may be bottoming. To be sure seasonal volatility associated with the timing of the Lunar New Year holiday may be helping but stimulus is likely helping too. Australia saw some upbeat February data over the last week with a bounce in retail sales and building approvals and the trade surplus rose to a new record high. And the pace of house price falls slowed a bit in March according to CoreLogic. This all provides a bit of confidence that March quarter GDP growth may have improved a bit from the dismal pace of 0.3% and 0.2% seen in the September and December quarters respectively. However, there are reasons for caution. First, economic data often runs hot and cold. Since Christmas we have had a long cold patch so a hot patch isn’t surprising. Second, its hard to see the surge in food sales, department stores, clothing and household goods that drove the bounce in February retail sales being sustained given ongoing soft wages growth and falling home prices. Third, the bounce in building approvals was driven by volatile apartments and the trend remains down. Fourth, the record trade surplus is good news, but it’s mainly being driven by high bulk commodity prices not by volumes. Fifth, business conditions PMIs and business confidence readings were soft in March. Finally, we saw the pace of home price declines slow a year ago only to accelerate again and in any case house price declines are now quite broad-based across capital cities and the negatives that are driving house price falls notably in Sydney and Melbourne remain in place, including tight lending standards, record unit supply, a collapse in foreign demand, uncertainty around the tax treatment of property investment and price falls feeding on themselves. So it is expected to still see further soft economic growth and home price falls ahead. Finally, while the Melbourne Institute’s Inflation Gauge saw a bit of a bounce in March, this seems to happen every few months and underlying inflation is still running at just 1.6% year-on-year. Meanwhile, the RBA remained on hold for the 32nd month in a row, but there were two marginal dovish tilts in its post meeting statement. The first was in acknowledging weak December quarter growth, particularly in consumer spending and the second in noting that it will “continue to monitor developments”. In the US, the minutes from the Fed’s last meeting (due Wednesday) will likely confirm its dovishness and this is likely to be supported by March CPI data (also due Wednesday) showing core CPI inflation remaining around 2.1% year-on-year. Job openings and hirings for February are likely to have remained strong and small business optimism (both due Tuesday) will be watched for a bounce. US March quarter earnings reports will start to flow. These are likely to see a distinct slowing to a slight decline or flat year-on-year as last year’s tax cut drops out and in response to slower growth but it’s also likely to be the low point for this year. The European Central Bank (Wednesday) is unlikely to undertake further monetary easing, having just done so at its last meeting, but it’s likely to signal a willingness to do more. Chinese data for March is expected to show continuing benign underlying inflation (Thursday) and an improvement in export and import growth (Friday). Credit data will also be released. In Australia, expect a continuing downtrend in housing finance (Tuesday) and a possible bounce in consumer confidence (Wednesday) thanks to the tax cuts. The RBA’s six monthly Financial Stability review will be released on Friday. Share markets – globally and in Australia – have run hard and fast from their December lows and are vulnerable to a short-term pullback. But valuations are okay, global growth is expected to improve into the second half of the year, monetary and fiscal policy has become more supportive of markets and the trade war threat is receding, all of which should support decent gains for share markets through 2019 as a whole. National capital city house prices are expected to fall another 5-10% into 2020, led by Sydney and Melbourne on the back of tight credit, rising supply, reduced foreign demand, price falls feeding on themselves and uncertainty around the impact of tax changes under a Labor Government. Cash and bank deposits are likely to provide poor returns as the RBA cuts the official cash rate to 1% by yea-end. The A$ is likely to fall into the US$0.60s, as the gap between the RBA’s cash rate and the US Fed Funds rate will likely push further into negative territory as the RBA moves to cut rates. Being short the A$ remains a good hedge against things going wrong globally. While Eurozone shares fell slightly, other major share markets rose over the last week helped by Fed dovishness. From their December low US shares are now up 21%, global shares are up 18% and Australian shares are up 14%. 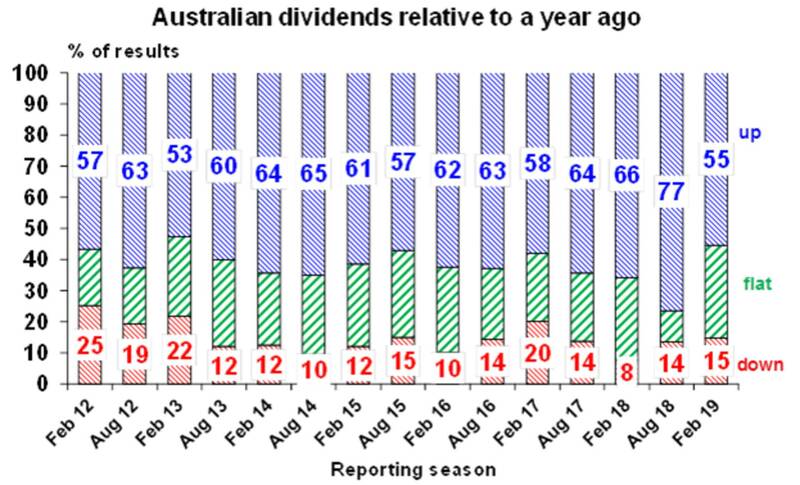 The underperformance of Australian shares in the rebound since December reflects the fact that they didn’t fall as much in last year’s share market slump and because the growth slump locally has weighed more on earnings expectations for Australian shares. Meanwhile bond yields continued their trend down over the last week, commodity prices were mixed with oil and gold up but copper and iron ore down and the $A rose slightly against a flat $US. How can shares rally and bond yields decline at the same time? Who is wrong? This is not unusual. The same occurred in 2016 with shares bottoming around February and bond yields not bottoming till around July/August. Its often referred to as being the “sweet spot” in the cycle where shares rebound from being undervalued and as investors start to anticipate stronger growth helped by easier central banks, but bonds are still responding to news of low inflation and expectations of lower interest rates for longer. This is exactly what we are seeing now. Bond yields may still have more downside but are likely to push up in the second half as global growth improves. Fed even more dovish both on rates and quantitative tightening. As expected, the Fed left rates on hold at its March meeting and while it revised down its growth forecasts a little bit it remains upbeat on the outlook and sees inflation staying around target. Consistent with its dovish tilt in January and inflation around target, the Fed remains “patient” on rates, its dot plot of rate hike expectations has been cut to no hike this year (from two hikes seen in December) with just one hike remaining next year and it has signalled that it will start slowing its balance sheet reduction (or quantitative tightening) from May and end it in September. In essence the Fed sees growth around potential, inflation around target, unemployment around NAIRU and rates around neutral so there is less pressure to do anything. So for now the Fed remains far less threatening for markets, but as we saw after a similar dovish tilt back in 2016 a return to a slightly more hawkish stance is a risk for later this year if as is expected, US growth picks up again against the backdrop of a still tight labour market. Getting closer to a US/China trade deal, but does this mean that Trump would open up a new trade war starting with auto tariffs on Europe? The past week saw ongoing argy bargy around US/China trade negotiations particularly around when the US would remove the tariffs on imports from China but this is to be expected. But a deal still looks likely as its in both sides interests and Trump continues to say that “the deal is coming along nicely”. But a deal with China would beg the question of whether Trump will then turn his attention to trade with Europe starting with auto tariffs. However, even though the Commerce Department is reported to have provided a rationale for tariffs to be imposed on auto imports on “national security” grounds and this may cause some market angst as Trump has to mid May to decide to or not, our assessment is that he probably won’t: the Commerce Department report looks like a negotiating stance with Europe; America’s trade deficit with Europe is small compared to that with China; public and Congressional support for a trade war with Europe is low; most of Trump’s advisers are against it; the EU would retaliate and this would badly affect states that support Trump that export to Europe; it would be a new blow to confidence and share markets ahead of Trump’s 2020 re-election campaign. The Australian Federal Budget to be handed down on April 2nd will have three obviously overlapping aims: to provide a fiscal stimulus in the face of flagging growth; to reinforce the Government’s budget management credentials by keeping the budget on track for a surplus in 2019-20; and to help get the Government re-elected in a most likely May 11 or 18 Federal election. In all of this it has been helped by a revenue windfall mainly due to higher corporate tax receipts on the back of higher commodity prices (partly due to Vale’s problems in Brazil) but also higher personal tax collections due to stronger employment growth and lower welfare spending partly offset by reduced growth forecasts for 2019-20 and 2020-21. This is likely to see the budget running around $5bn better than expected in the December MYEFO for 2019-20. However, given the need for a fiscal boost and pre-election sweeteners the Government is likely to “spend” the bulk of the revenue windfall. Expect around an additional $3bn in personal tax cuts which along with the roughly $3bn pa already allocated for tax cuts in December’s MYEFO and the $3bn already legislated for following last year’s budget is expected to result in total personal income tax cuts of around $9bn from July which are likely to be skewed towards low- and middle-income earners. There is also likely to be extra spending on health and infrastructure. Key Budget numbers for 2019-20 are expected to be: a budget surplus of around $5bn after budget handouts (or $10bn before any stimulus), real GDP growth of 2.5%, inflation of 2.25%, wages growth of 2.75% and unemployment of 5%. The upside of the Australian Government’s Budget strategy is that the household sector will receive a boost just at the time it needs it given falling house prices and likely rising unemployment and of course a budget surplus is at last coming into sight after a record 11 years in deficit. The downside is that the tax cut boost to the household sector will like be small at around 0.5% of GDP, there is less assurance of a boost to the economy from tax cuts as opposed to “cheques in the mail” or increased government spending, the election means greater uncertainty about whether and when the stimulus will actually be delivered and the budget projections will come with a high level of uncertainty as the revenue boost from higher iron ore prices may prove temporary and slower economic growth will weigh on revenue. The stimulus is unlikely to be enough to head off the need for RBA rate cuts. US data was mostly positive adding to the view that while the March quarter may be weak, growth is likely to bounce back up again. A home builders conditions index was flat in March but current sales and expectations improved, manufacturing conditions in the Philadelphia region improved in March, the leading index rose more than expected in February and jobless claims fell. Australian jobs data added nothing to the debate about whether to cut rates or not. Unemployment fell, but this was due to reduced labour market participation. Employment slowed but this was after a huge surge in January so could just be noise. That said skilled job vacancies fell again in February consistent with falling ANZ job ads in pointing to slower jobs growth ahead. And the labor market is a lagging indicator. It is likely to see unemployment rising to 5.5% over the next year. There was a bit of good news with a rise in the CBA’s composite business conditions PMI for March, but this looks like normal volatility and at a reading of 50 it remains very weak. Population growth remains strong – good for growth and good for underlying housing demand, but remember the focus should be on growth in GDP per person because that is more relevant for living standards. ABS data showed that population growth remained unchanged at a strong 1.6% over the year to the September quarter with 1 percentage point of that coming from migration and the rest from natural growth. Strong population growth naturally helps support demand in the economy and is a source of support for house prices (although a bunch of negative factors are dominating in the short term). But it also means that in Australia we have to have GDP growth in excess of 1.6% pa to grow GDP per person, whereas in Europe its just 0.2% and in Japan its -0.2% to do the same. Why will limiting negative gearing and halving the capital gains tax discount push up rents and push down property prices? Several studies have looked at this issue with similar conclusions since it became part of Labor Party policy in 2016. The answer is quite simple. If negative gearing is limited and capital gains tax increased then investors will demand a higher pre tax return to invest in property. Looked at in rental yield terms (ie annual rents divided by prices) SQM Research after examining international comparisons, what the tax changes would mean financially to taxpayers and the 1985-87 experience when negative gearing was briefly removed – estimate that rental yields are likely to rise around 1 percentage point over a 2-3 year period if the tax changes are made. This would occur via less investor demand in the property market causing some combination of lower property prices and rising rents (partly due to less property construction) until it becomes attractive to invest in property again. 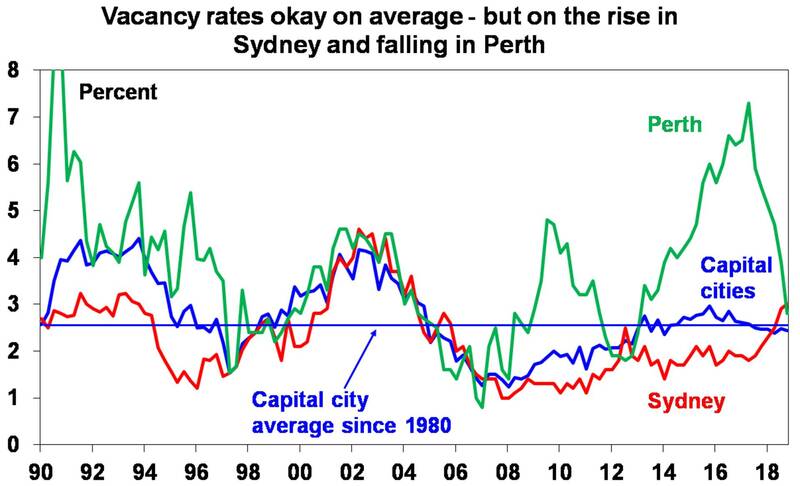 On their estimates average capital city property prices would fall 4 to 8% (but fall 7 to 12% in Sydney and fall 8 to 13% in Melbourne) and rents rise 7 to 12% in response over 3 years. Now this assumes two interest rates cuts and if that doesn’t occur the estimated fall in property prices is 5 to 12% relative to what otherwise would have occurred. A study last year by Riskwise Property Research and Wargent Advisory reached similar conclusions in terms of prices. Of course other things could reduce this impact like a new first home owners grant scheme and if rental yields have already increased anyway. Would property investors rush into to the market ahead of the changes if they are confirmed so they can be grandfathered? Maybe. But they may also decide not to because they would worry that their investment property will be worth less once the tax changes occur. Regardless of the merits of such changes, this issue is another drag on the residential property price outlook. In the US, data releases are expected to show a fall back in housing starts after January’s surge, but continued modest gains in home prices and a slight further rise in consumer confidence (all due Tuesday), a slight improvement in the trade balance for January (Wednesday), a downwards revision to December quarter GDP growth (Thursday) from 2.6% annualised to 2.4%, a fall in pending home sales (Thursday) but a rise in new home sales (Friday), a modest gain in January consumer spending (also Friday) along with core private consumption deflator inflation staying at 1.9% year on year. Eurozone economic confidence data for March to be released Thursday will be watched for signs of stabilisation after falling over the last year and core inflation (Friday) is likely to have remained stuck around 1%yoy. Japanese jobs data for February (Friday) is likely to have remained strong but industrial production is likely to bounce. In Australia, ABS job vacancy data for February due Thursday is expected to show some signs of softening consistent with the ANZ job ads survey, and private credit growth (Friday) is likely to have remained modest in February with housing investor credit remaining weak. Public addresses by RBA officials Ellis and Kent on Tuesday and Wednesday will be watched for any clues on the interest rate outlook. Share markets – globally & in Australia – have run hard and fast from their December lows and are vulnerable to a short-term pullback. But valuations are okay, signs of improving global growth are emerging, monetary and fiscal policy has become more supportive of markets and the trade war threat is receding all of which should support decent gains for share markets through 2019 as a whole. Low yields are likely to see low returns from bonds, but they continue to provide an excellent portfolio diversifier. Expect Australian bonds to outperform global bonds. Unlisted commercial property and infrastructure are likely to see a slowing in returns over the year ahead. This is particularly likely to be the case for Australian retail property. National capital city house prices are expected to fall another 5-10% into 2020 led again by 15% or so price falls in Sydney and Melbourne on the back of tight credit, rising supply, reduced foreign demand, price falls feeding on themselves and uncertainty around the impact of tax changes under a Labor Government. Global share markets rebounded over the last week helped by benign economic data and China’s confirmation of policy stimulus. US and Eurozone shares rose 2.9%, Japanese shares gained 2% and Chinese shares rose 2.4%. Australian shares fell 0.5% though, with consumer and financial shares down on worries about the economy. Bond yields were basically flat in Germany & Japan but fell in the US and the Australian 10-year bond yield fell below 2% for the first time since 2016, as weakening economic data added to expectations for RBA rate cuts. Commodity prices rose, in particular oil and iron ore. The $A also rose slightly as the $US slipped. It looks like the timing of a US-China trade deal is slipping into April at the earliest, on disagreements about enforcement, tariff reductions and a meeting between Presidents Trump and Xi (the Chinese side would naturally be worried that Trump may “walk”). But a deal is still likely as it’s in both sides’ interest, with US Trade Rep Lightizer saying negotiations are in the final stage. The indications are that it’s likely to be more than just a superficial commitment by China to buy more US goods but include reduced tariffs, reduced non-tariff barriers, relaxed or eliminated joint venture requirements, better market access and bans on stealing intellectual property. While a deal is ultimately expected, news of setbacks or delays have the potential to trigger a pullback in shares with a deal looking like it’s already factored into markets. Don’t panic! don’t panic! while the UK parliament rejected PM May’s Brexit deal a second time, it has also voted down a no deal Brexit and supported a short extension to the Brexit date so it can have another go at voting on May’s twice rejected deal! Clearly May is trying to back the Brexiteers into supporting it, as if they don’t parliament will take over increasing the odds of no Brexit. While the rejection of a no deal Brexit was positive the margin was low, the vote was non-binding and in any case there is no majority support in Parliament for any one deal. So while the British pound hit a 9-month high in the last week, the Brexit comedy has a long way to go yet to being resolved. The best solution would be to have another referendum – which would likely see Bremain win. For investors on the other side of the world though it’s all just an entertaining sideshow having little impact on global markets (beyond the UK itself). Bigger tax cuts on the way in Australia in the April Budget. The Federal Government’s Mid-Year Economic and Fiscal Outlook set aside around $3 billion a year in revenue “decisions taken but not yet announced” starting from next financial year and this presumably refers to tax cuts. On top of this, budget data up to January shows this year’s budget tracking around $3 billion a year better than MYEFO projected and the rise in the iron ore price is likely to have added to this, although it may be partly offset by a downgrade to economic growth, employment and wages assumptions for 2019-20. 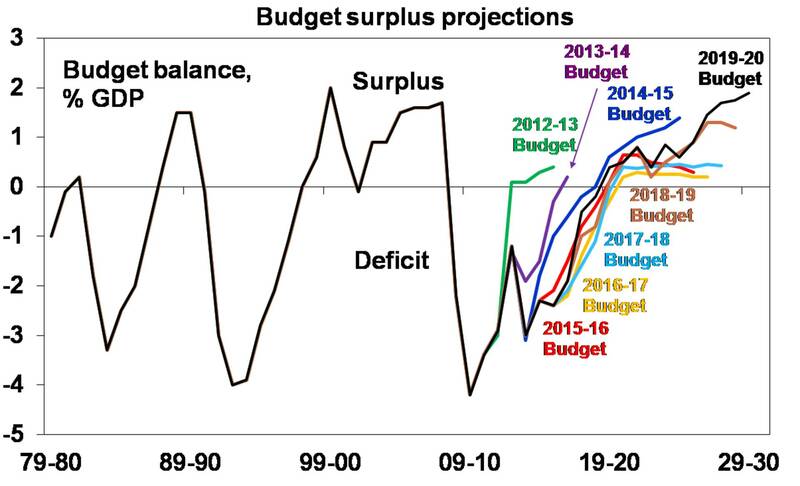 Overall though it looks like there is scope for around $6 billion in extra fiscal stimulus in 2019-20 that would basically leave the budget projections into a surplus unchanged. It would make sense for the Government to do this given the loss of growth momentum in the economy, but it would only be around 0.3% of GDP so a pretty small stimulus and the election would add a bit of uncertainty as to its timing. That said, this is on top of the $3 billion in tax cuts already legislated from the May Budget last year. So, all up it would amount to a fiscal stimulus of around 0.5% of GDP, most of which would go to the household sector just at the time it needs it given falling house prices and a likely rise in unemployment. It won’t be enough to head off the need for RBA rate cuts, but it will help. Was the Australian house price boom all due to lower interest rates? RBA researchers put out a great paper modelling the Australian housing market over the last week. Two things particularly are worth a mention. 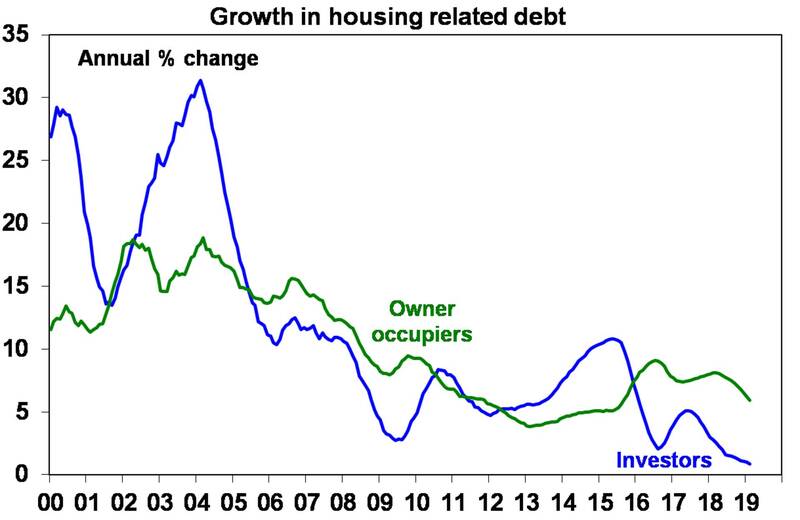 First the model suggests that most of the boom in Australian house prices since 2011 was due to lower interest rates. While it’s agreeable that lower rates played a big role in the surge, the only problem is that Australian house price-to-income ratios ended up in 2017 being way way above those in comparable countries who have even lower interest rates. So despite the model – which is not foolproof – it seems clear to me that other factors have actually played a bigger role. These include the initially slow supply response, foreign buying, SMSF buying and aspects of the tax system all of which helped drive speculative buying ultimately culminating in a bubble in some cities. Second, the RBA paper highlights the risk that if home owners adjust their 10-year expected real house price gain from say 2.5% p.a. to zero, real house prices could fall by a third. Of course, rate cuts and other measures can help offset this, but the sensitivity analysis highlights the risk of FONGO (fear of not getting out) taking hold. Net rental yields of just 1 or 2% may be okay for investors when property prices are expected to rise at a decent rate, but they are not okay if investors revise down their capital growth expectations in response to now falling prices. If this occurs yields will need to adjust upwards via prices falling even further. Meanwhile, the divergence in the Australian property market is highlighted by rental property vacancy rates which are pushing higher in Sydney and plunging in Perth, which explains why rents are falling in Sydney and starting to rise in Perth, all of which is consistent with further falls in Sydney property prices but a (slowly!) improving outlook for Perth property prices after their plunge since 2014. US data releases mostly pointed up over the last week. Industrial production was weak, new home sales fell and the headline manufacturing conditions index for the New York region fell. But against this retail sales, capital goods orders and construction spending all bounced back in January, consumer confidence rose, job openings rose further, small business optimism rose a bit in February and the details of the New York manufacturing conditions survey pointed to some improvement. Despite this March quarter GDP growth looks to be very weak (with the Atlanta Fed’s GDP Now estimating growth of just 0.4% annualised) not helped by the weak base set in December with December retail sales for example revised down even further. However, the March quarter is well known for soft growth which may be partly weather-related and at least growth indicators are pointing to a rebound. Meanwhile, inflation remains benign with core CPI inflation falling to 2.1% year-on-year in February which translates to inflation of around 1.8% year-on-year on the Fed’s preferred measure. All of which remains consistent with the Fed remaining in pause mode on rates. Eurozone industrial production also perked up in January, with Germany still weak but production up in France, Italy and Spain. The Bank of Japan maintained its ultra-easy monetary policy as widely expected and downgraded its economic outlook. Chinese January/February activity data was on the soft side with a further slowdown in industrial production to 5.3% year-on-year, a rise in unemployment to 5.3%, unchanged growth in retail sales of 8.2% year-on-year and just a slight acceleration in investment growth to 6.1%. Chinese GDP growth is likely to have slowed a bit further this quarter but should pick up into the second half as policy stimulus impacts and there are already signs of this in the pick up in investment growth and credit growth averaged over January and February. Australian data was soft over the last week with falls in business confidence, consumer confidence and housing finance. The ongoing fall in housing finance indicates that tight credit conditions are continuing. The housing downturn along with weak economic news generally looks to be feeding into consumer confidence. The risk is that weakening business conditions will damage the nascent recovery in business investment which is a source of growth for the economy. 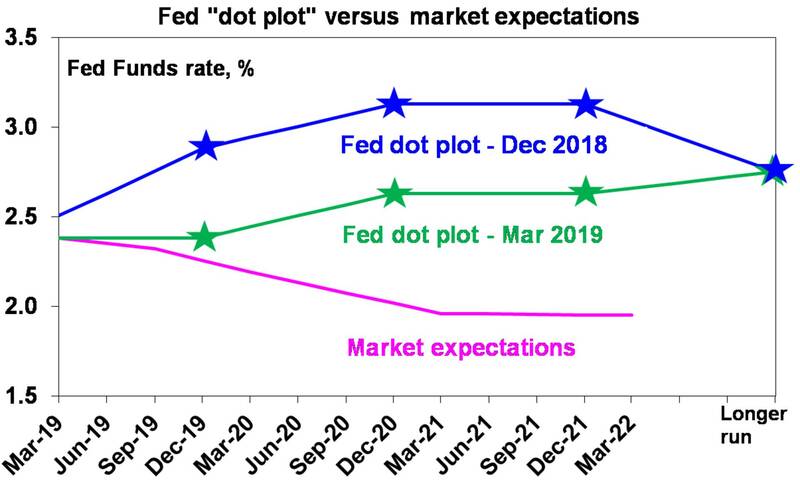 In the US, expect the Fed (Wednesday) to leave interest rates on hold and indicate that the pause will continue for some time yet, with the Fed’s dot plot of interest rate hikes for this year likely to drop from 2 hikes (as of last December’s meeting) to one or none. But even more significantly, it’s likely to make some reference to moving to a framework that targets average inflation over time with the implication that it will allow a period of inflation above 2% (to make up for all the years below) and there is a good chance that it will indicate a tapering in its process of balance sheet reduction (or quantitative tightening) in the second half ahead of ending it early next year. All of this is likely to be taken as dovish by investment markets. On the data front in the US, expect a further slight rise in home builder conditions (Monday), some improvement in the Philadelphia Fed’s manufacturing conditions index (Wednesday) and solid readings for March business conditions PMIs (Friday) and a rise in existing home sales (also Friday). The UK will likely see another vote on May’s Brexit deal after which PM May will then ask the EU for a short extension to the Brexit date if her deal is finally supported or a long extension if its not. Eurozone manufacturing conditions PMIs (Friday) will likely show a rise after falling below 50 in February. Japanese core inflation for February (Friday) is expected to remain weak at 0.4% year-on-year keeping the BoJ ultra easy. In Australia, expect ABS data to show a 2% fall in house prices (Tuesday) for the December quarter consistent with private sector surveys and February labour force data (Thursday) to show a 5,000 gain in jobs and unemployment rising to 5.1%. The CBA business conditions composite PMI for March is likely to have remained weak. The minutes from the last RBA board meeting (Tuesday) will likely maintain a neutral bias on interest rates. Share markets – globally and in Australia – have run hard and fast from their December lows and, with global economic data still soft, they are vulnerable to a short-term pullback. But valuations are okay, and reasonable growth and profits should support decent gains through 2019 as a whole helped by more policy stimulus in China, Europe and Australia and the Fed pausing. Major global share markets fell over the last week on worries about global growth, with US shares down 2.2%, Eurozone shares down 1.3%, Japanese shares losing 2.7% and Chinese shares down 2.5%. Australian shares pushed 0.2% higher though on increasing expectations for rate cuts offsetting, for now, the negative impact of slowing growth. Bond yields fell as the ECB announced more monetary easing and on growth worries. Commodity prices were mixed, with metals and iron ore down but oil and gold up. The $A fell on increasing expectations for RBA rate cuts as the $US rose. There were three positives on the global policy/geopolitics front over the last week. First, reports indicate that the US and China are close to a trade deal and that President Trump is keen to announce a win on this ahead of his 2020 election campaign. Second, China’s National People’s Congress saw more policy stimulus announced (including a cut to the Value Added Tax rate equal to around 0.6% of GDP) with the growth target set at 6-6.5% for this year which is in line with market expectations. Finally, as widely expected the European Central Bank announced another round of cheap bank funding (which is a form of quantitative easing) and further pushed out its commitment to keep interest rates down. A settling of trade issues and a shift to policy stimulus (or at least more dovishness in the case of the Fed) is consistent with views that global growth will improve into the second half this year and the combination of stronger growth supporting profits and still easy monetary policy will likely make this a good year for shares. The trouble in the short term though is that share markets – both globally and in Australia – have run hard and fast from their December lows and, with global economic data still weak right now, they are vulnerable to a short-term pullback. First, economic growth has definitely slowed further and is likely to remain weak going forward as the housing downturn continues, dragging on construction activity and consumer spending. Second, while we have gone into a “per capita recession” with two quarters of growth running below population growth, these have occurred occasionally before, with the last one in 2006 in the midst of the mining boom! In fact, many pepople had never heard of the term so there is a danger in reading too much into it, just as many did a few years back with the obsession about an “income recession”. Third, a conventional recession remains unlikely given that the mining investment slump is near its bottom, non-mining investment is looking healthier, infrastructure investment is strong, global and specifically Chinese growth is likely to pick up later this year, the April budget is likely to see tax cuts/fiscal stimulus and the RBA can cut interest rates. Fourth, while a conventional recession is unlikely, growth is likely to be well below what the RBA is expecting, and this will drive higher unemployment and lower for longer wages growth and inflation, the anticipation of which will drive the RBA to cut interest rates at least twice this year. It was thought that this would not occur until August, and after the budget and election were out of the way so the central bank could get a chance to assess any fiscal stimulus, however the run of weak data is increasing the risk that the first cut will be sooner. Maybe even on budget day next month to get it out of the way before the election campaign! Waiting for unemployment to rise runs the risk of being too late! 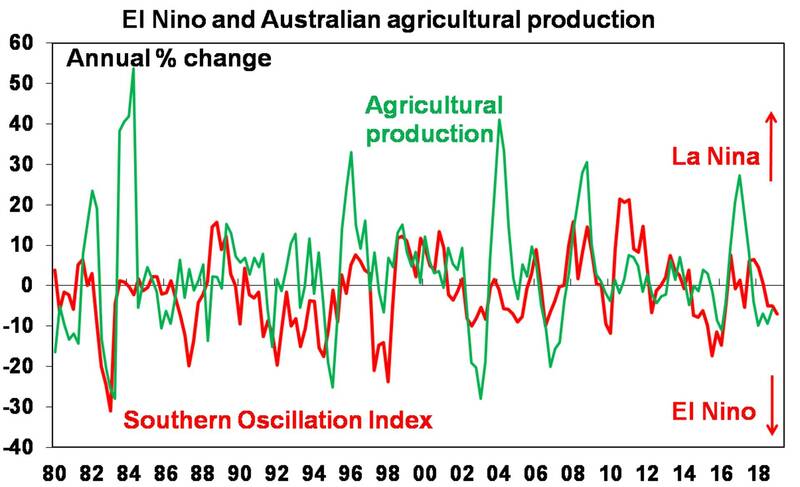 Finally, it’s worth noting that the east coast drought is continuing, with the Southern Oscillation Index indicating a minor El Nino. Over the last year the drag on growth has only been around 0.15 percentage points, but it could increase the longer the drought continues. A rising risk facing the RBA is that the 2-3% inflation target will lose credibility. 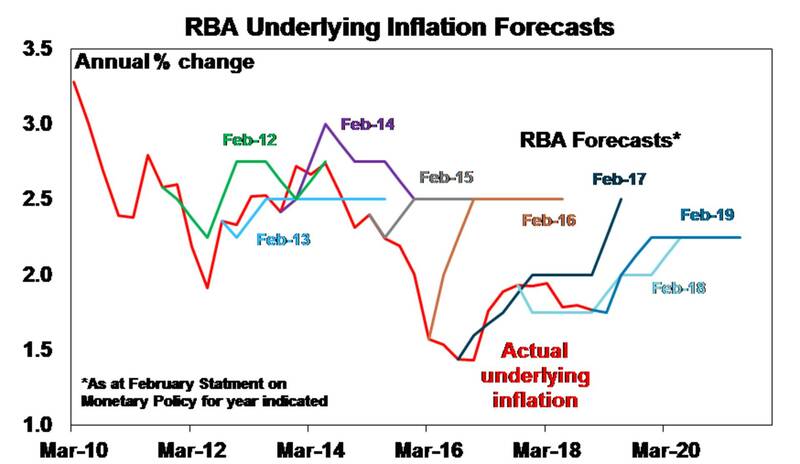 For several years now the RBA has been forecasting inflation to move back towards the mid-point of the target range. 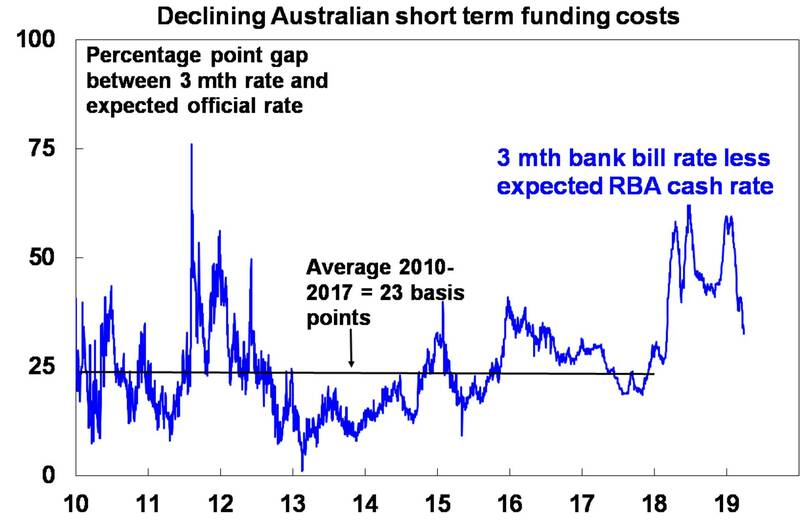 But as can be seen in the next chart these expectations have proven way too optimistic (and this has been the case for many forecasters, not just the RBA!). The danger is that the longer inflation remains below target, the more it will be expected to remain down and the harder it will be to get it up as the experience in Japan and Europe demonstrates. All of which is an argument for the RBA to cut rates sooner rather than later. The latest Financy Women’s Index for the March quarter showed that women are making financial and economic progress across areas like education, work, wages, leadership and superannuation, but there is a long way to go to achieve financial equality with men. It’s worth a look. US data was mixed, but okay. The non-manufacturing conditions ISM rose very strongly, new home sales rose for the second month in a row and housing starts rebounded in January. Against this, the trade deficit widened in December, construction spending fell and payroll employment rose a much less than expected 20,000 in February. However, it would be wrong to read too much into the soft February outcome as it’s probably payback for the unbelievably strong 311,000 payroll gain in January, the 3-month average in jobs growth is a solid 186,000, it may have been partly weather-related, with construction jobs down and both unemployment and underemployment actually fell. Meanwhile, wages growth edged up further to 3.4% year-on-year but still remains relatively benign in terms of driving inflationary pressure. Overall, the jobs report is not as weak as the headline payroll number suggests, but it’s consistent with the Fed remaining in pause mode. The European Central Bank has finally accepted reality and revised down its growth and inflation forecasts and announced another round of cheap bank funding conditional on lending to the private sector (what they call TLTRO) and pushed out its commitment to not raise rates out to the end of the year in response. Quite clearly, it ended quantitative easing too early and is now seeking to correct the mistake. This is a move in the right direction and adds to confidence that Eurozone growth will stabilise and improve this year. That said, the ECB may still have to do more as it not clear that its new round of TLTROs is aggressive enough. Japanese data showed a stronger than first reported recovery in December quarter GDP and better consumer spending. Chinese trade data was very weak in February but looks to have been exaggerated by Lunar New Year holiday distortions. Averaging across January and February still saw exports fall nearly 6% year-on-year, reflecting an unwinding of the front-running of exports last year ahead of US tariffs and slower global growth and imports fell 3% year-on-year, reflecting slow domestic demand. Australian data released over the last week was decidedly soft. December quarter GDP growth was just 0.2% quarter-on-quarter, with broad based weakness (apart from government demand) and ongoing signs that the housing downturn is impacting consumer spending and this followed similarly weak growth in the September quarter. What’s more, building approvals and retail sales remained weak in January, service sector conditions PMIs remained very weak in February and ANZ job ads fell further in February, suggesting that weak growth will soon show up in slowing jobs growth and rising unemployment. On top of this, the Melbourne Institute’s Inflation Gauge showed continuing below-target inflation in February. It wasn’t all bad though, with another spike in the trade surplus in January – although mainly due to gold exports, it nevertheless highlights the strength in export prices and holds out the possibility that net exports will contribute to growth this quarter. Overall though it adds to the argument for the RBA to cut rates sooner rather than later. In the US, expect a modest bounce back in January retail sales (Monday) after their December slump, February core inflation (Tuesday) to fall slightly to 2.1% year-on-year, durable goods orders (Wednesday) to show a modest gain and industrial production (Friday) to bounce back for February. In the UK, it will be back to another round of parliamentary votes on Brexit on Tuesday on: May’s Brexit deal; a No Deal Brexit; a delay to 29 March Brexit date; and also on whether to have a second referendum. At this stage, parliament probably won’t support the Brexit deal (although it’s close), it will reject a No Deal Brexit and vote for a delay, but a new referendum likely won’t get up (just yet). Views remain that the final outcome will be either some sort of soft Brexit (as there is no majority in parliament for a No Deal or hard Brexit) or another referendum which turns into Bremain. The Bank of Japan is not expected to make any change to its ultra easy monetary policy on Friday with indicators regarding growth and inflation remaining soft. Chinese economic activity data for January and February (Thursday) are likely to show some further slowing in industrial production (to 5.7% year-on-year) and retail sales (to 8.5%) but a slight acceleration in fixed asset investment (to 6%). Chinese growth may slow a bit further in the current quarter, but with stimulus measures it’s likely to pick up into the second half. In Australia, expect to see a bounce in housing finance (Tuesday), but weaker readings for business confidence (also Tuesday) and consumer confidence (Wednesday). Shares are likely to see volatility remain high, with a high risk of a short-term pull back, but valuations are okay, and reasonable growth and profits should support decent gains through 2019 as a whole, helped by more policy stimulus in China, Europe and Australia and the Fed pausing. National capital city house prices are expected to fall another 5-10% into 2020, led again by 15% or so price falls in Sydney and Melbourne on the back of tight credit, rising supply, reduced foreign demand, price falls feeding on themselves and uncertainty around the impact of tax changes under a Labor Government. Cash and bank deposits are likely to provide poor returns, as the RBA cuts the official cash rate to 1% by end 2019. The $A is likely to fall into the $US0.60s, as the gap between the RBA’s cash rate and the US Fed Funds rate will likely push further into negative territory as the RBA moves to cut rates. Being short the $A remains a good hedge against things going wrong globally. While US shares fell slightly over the last week (with geopolitical noise not helping most major share markets) Australian shares continued to rise, arguably playing catch up to the rally in US shares. The Australian share market was led higher by health, IT, banks and industrial shares.Bond yields generally rose as did oil and metals, but iron ore prices continued to retrace some of the Vale accident driven rally. The $A fell slightly despite a lower $US as rate cut talk continued. Our view remains that a US/China trade deal is likely as its in both sides interests and Trump seems increasingly keen on a deal (because not having one would risk a return to last years blows to share markets and confidence threatening his re-election prospects) and comments by Treasury Secretary Mnuchin and White House economic adviser were a lot more upbeat. Michael Cohen’s testimony provided lots of interesting observations about President Trump that have been lapped up by his opponents but it’s unlikely to be enough to convince 67 senators to remove him from office even if the House moves to impeachment. Kim Jong Un is unlikely to push things so far that his regime’s existence starts to come under threat again, he wants to meet up with Trump again and Trump still seems keen on a deal, just that he’d “rather do it right than do it fast”. Tensions between Pakistan and India are a worry given their nuclear status but they have been flaring up and down for decades so don’t read too much into the latest skirmishes. But with shares up dramatically from their December lows (by 19% in the US, 16% globally and 13% in Australia), up against resistance and overbought at a time when global growth is still softening one or several of these geopolitical risks could provide a trigger for a short term pull back in share markets. Views remain though that it would just be a pull back/re-test as opposed to the resumption of last year’s falls as policy stimulus and an improvement in global growth should help ensure that shares have a reasonable year. US data was mixed over the last week, but the good news is that forward looking indicators are moving up. December quarter GDP growth slowed but to a stronger than expected annualised pace of 2.6% thanks to solid growth in consumer spending and business investment. More negatively housing starts fell a sharp 11% in December. However, permits to build new homes held up in December, pending home sales bounced in January after several weak months, consumer confidence rose sharply in February and various regional manufacturing surveys showed improvement too. So while GDP growth is likely to slow further this quarter (partly due to weather related seasonal weakness) it is likely to pick up again into the second half. Meanwhile Fed Chair Powell provided no surprises in indicating that current conditions are “healthy” and the outlook is “favourable” but there are some “cross currents and conflicting signals” so the Fed is “patient” and “will continue to be data dependent.” Expect the pause on interest rate hikes to continue into the second half. Eurozone economic sentiment slipped a bit further in February and lending growth slowed adding pressure on the ECB for further monetary easing. Japanese jobs data remained strong in January, but this is being helped by the falling population and meantime industrial production fell sharply in January. Chinese official business conditions PMIs fell a bit further in February, but the services sector continues to hold up well, manufacturing sector new orders rose and the Caixin manufacturing conditions PMI rose suggesting policy stimulus may be starting to impact, particularly for smaller businesses which had been harder hit by the slowdown. Australian data was generally soft. House prices continued their slide in February, credit growth remained soft in January with housing credit growth slowing to its weakest on record and construction activity showed broad based falls in the December quarter. Against this, plant and equipment investment saw a modest rise in the December quarter and business investment plans continue to improve suggesting that business investment should help contribute to keeping the economy growing as the housing cycle turns down. CoreLogic data showed that the slide in home prices continued in February with national capital city prices now down 8.6% from their September 2017 high. Tight credit (which will be given another boost along from mid-year by the start-up of Comprehensive Credit Reporting which will see banks crack down on borrowers with multiple undeclared loans), the switch from interest only to principle and interest loans, record unit supply, issues around new building quality after problems with various unit towers, an 80% or so collapse in foreign demand, fears that negative gearing and capital gains tax arrangements will be made less favourable if there is a change of government and falling prices feeding on themselves are driving a perfect storm for the Sydney and Melbourne property markets, with Perth and Darwin still falling sharply and most other cities pretty soft. It is likely to see Sydney and Melbourne home prices falling another 15% or so as part of a total top to bottom fall of 25%, which with little change in average prices across other cities will see national average home prices fall another 5 to 10%. While this will be a drag on economic growth it’s unlikely to drive a recession as property price weakness will mainly be concentrated in Sydney and Melbourne, the growth drag from falling mining investment is fading, non-mining investment is trending up and infrastructure spending is rising, the RBA can and likely will cut interest rates again and a likely further fall in the Australian dollar will help support growth. The Australian December half earnings reporting season is now complete and while better than feared it showed a slowdown for companies exposed to the domestic economy and caution regarding the outlook. 54% of companies have seen their share price outperform on the day of reporting (which is in line with the long term average), but only 38% have surprised analyst expectations on the upside which is below the long run average of 44%, 36% have surprised on the downside which is above the long run average of 25%, the proportion of companies seeing profits up from a year ago has fallen to 59% and only 52% have raised their dividends which is a sign of reduced confidence in the outlook six months ago it was running at 77%. Concern has been most intense around the housing downturn and consumer spending. While 2018-19 consensus earnings growth expectations have drifted up to 5% (from 4.3% at the start of the reporting season) this was due to an upgrade for resources stocks as higher iron ore prices were factored in. For the rest of the market consensus earnings expectations have slipped to just 2% reflecting the tougher domestic environment. 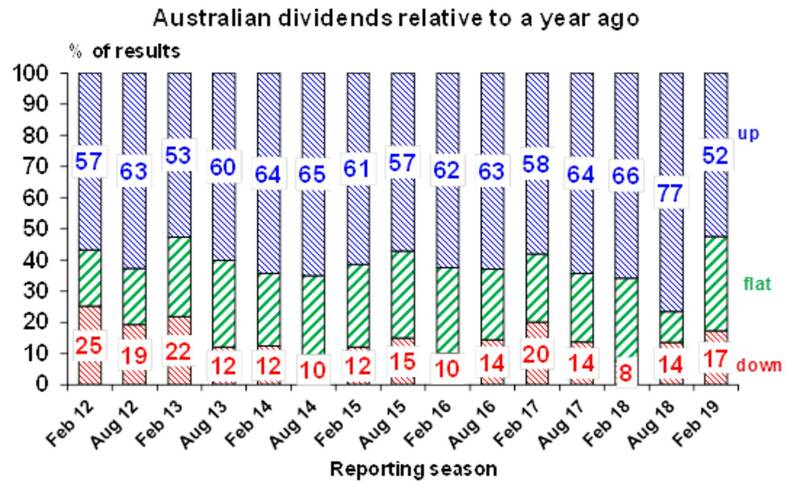 While several cashed-up companies announced special dividends ahead of Labor’s proposed excess franking credit cutback, overall dividend upgrades have fallen. In the US the focus will be on Friday’s February jobs data which is expected to show solid payroll growth of 180,000, a fall in unemployment to 3.8% and wages growth of 0.3% month on month or 3.3% year on year. In other data expect the non-manufacturing conditions ISM to have remained strong at around 57 and new home sales to rise slightly (both due Tuesday), the trade balance (Wednesday) to worsen and January housing starts (Friday) to show a bounce after December’s fall. The Fed’s Beige of anecdotal evidence will also be released. The European Central Bank (Thursday) is expected to announce or foreshadow a new round of cheap bank financing (LTRO) to help arrest the slowdown in economic growth seen over the last year. Chinese February trade data (Friday) is expected to show a slowdown in export growth to around 1% year on year (after January’s bounce) but an improvement in import growth to around 0.5%yoy. The Reserve Bank of Australia is expected to leave interest rates on hold for the 28th meeting in a row when it meets Tuesday and to reiterate its balanced or neutral outlook for interest rates.Outside of the monthly labour force reports Australian economic data has been mostly soft lately and views remain that the RBA will cut the cash rate twice this year taking it down to 1% as the housing slowdown cuts into growth and threatens the inflation outlook. But the first cut is unlikely until around August after the RBA gets to see the outcome of the April Budget and the Federal election and revises its growth and inflation forecasts down further. On the data front in Australia, expect December quarter GDP growth (Wednesday) of just 0.2% quarter on quarter or 2.4% year on year reflecting continuing weak consumer spending, weak construction activity and a zero contribution to growth from trade only partly offset by strength in public spending. Monthly data releases are expected to show a bounce in building approvals (Monday) after a few months of sharp falls, a 0.4% rise in December retail sales and a reduced trade surplus of $2.5bn (both due Thursday). Shares are likely to see volatility remain high with a high risk of a short term pull back, but valuations are okay, and reasonable growth and profits should support decent gains through 2019 as a whole helped by more policy stimulus in China, Europe and Australia and the Fed pausing. Share markets continued to rise over the last week helped by good news regarding US/China trade talks. US shares rose 0.6%, Eurozone shares gained 0.8%, Japanese shares rose 2.5% and Chinese shares rose 5.4%. Australian shares rose 1.7% helped by reasonable earnings results, more talk of rate cuts and upgrades to earnings growth expectations for resources stocks on the back of higher commodity prices. Bond yields were flat to down a little bit. Oil, gold and metal prices rose but iron ore prices fell back a bit but remain very high. The $A fell slightly despite a lower $US as rate cut talk continued. Momentum is continuing to build towards a resolution of the US/China trade dispute. There is more to go, but President Trump has extended the March 1 deadline to further raise tariffs on Chinese imports as a result of “substantial progress” in trade talks with China. If there is further progress President’s Trump and Xi plan to meet conclude the agreement. Views remain that a deal is likely as it’s in both sides interests after the mayhem in business confidence and share markets last year’s trade war flare up contributed to. Trump knows this and wants to make sure that an escalating trade war does not threaten his 2020 re-election prospects by pushing up unemployment. 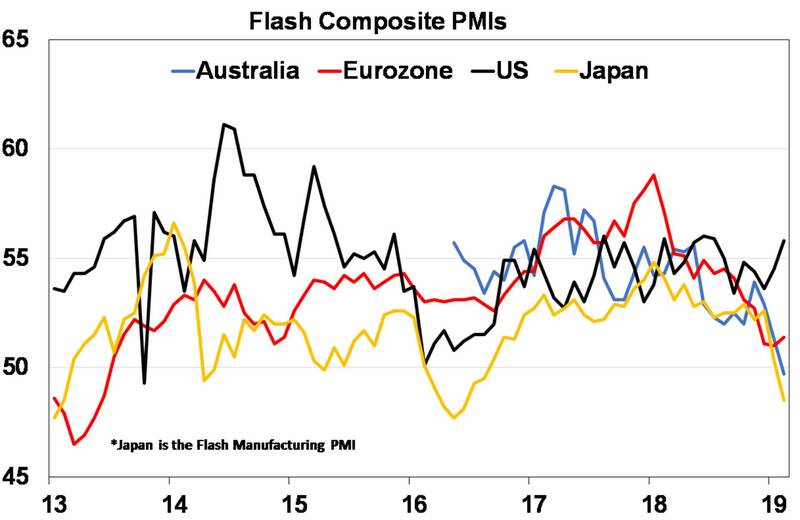 Business conditions PMIs were mixed in February – up in the US and Eurozone driven by services but with manufacturing conditions falling in the US, Eurozone and Japan. And Australia was weak. The current environment can still be viewed as like in 2011-12 and 2015-16 both of which saw shares fall 20% or so as PMIs fell only to then see a rebound. But at this stage we are still waiting for a clear rebound in PMIs which is leaving shares vulnerable to a pullback in the short term, although expect policy stimulus to underpin stronger PMIs (and shares) into the second half of the year. Meanwhile the Brexit saga continues with MPs now defecting from Labour and the Conservatives. Brexit was sold on half-truths by the Brexiteers – that the UK could have its cake (free trade with the EU) and eat it too (without the EU’s rules and restrictions). Of course, this was never on as far as the EU was concerned, but it got the yes vote over the line. So, the referendum has left a mess to try and sort out (for a parliament that doesn’t have majority support for Brexit).now have a better understanding of the facts. This all has a way to go which is not great for the UK economy. It’s hard to get too excited at this stage by reports of Chinese restrictions on imports of Australian coal. 25% of Australian coal exports go to China and if there is a ban on all of this it could knock up to 0.7% off Australian GDP. This is very unlikely though as so far it looks like slower processing as opposed to a complete ban, it would violate the free trade agreement between Australia and China and in any case Australian coal exports can be diverted to other markets as China still needs the coal. It will be a bigger issue though if it signals deeper problems in Australia’s relationship with China. US data was mixed over the last week. Underlying capital goods orders, the Leading Index and manufacturing conditions in the Philadelphia region were all soft but jobless claims fell, home builder conditions rose and the composite PMI for February rose (with manufacturing down but services up). All of which is consistent with the Fed staying on hold. Meanwhile, the minutes from the Fed’s January meeting confirm its dovish shift on rates – with it seeing few risks to pausing rates and unclear as to whether it will raise rates later this year or leave them on hold – and in relation to quantitative tightening with the Fed heading towards ending its balance sheet reduction by year end. In terms of the latter expect some sort of formal announcement at the March meeting with a likely slowing (or taper) in the rate of QT and its end by the end of the year which will leave the Fed’s balance sheet far higher than previously expected. Of course, whatever it does will be contingent on economic conditions. Is the Fed heading towards easier monetary policy for even longer? This year the Fed is undertaking a review of its approach with some Fed officials extolling the benefits of “average inflation targeting” which would currently accept an overshoot of the 2% inflation target to make up for all the years that inflation has been below target. The Fed goes in circles on this issue and it’s arguably what should be implied by the Fed’s current reference to the inflation target being “symmetric”. But if “average inflation targeting” is adopted then it could imply that the current pause on rates goes for longer than otherwise (which would be good for risk assets like shares and negative for the $US) but then bond yields would eventually go higher than otherwise (which would eventually be bad for risk assets and positive for the $US as the Fed has to tighten by more down the track). The US December quarter earnings reporting season is now 90% done and remains much better than feared. 72% beat on earnings with an average beat of 3.2% and 59% beat on sales. Earnings growth is running at 18.5% year on year for the quarter. But as can be seen in the next chart the level of surprises and earnings growth is down. 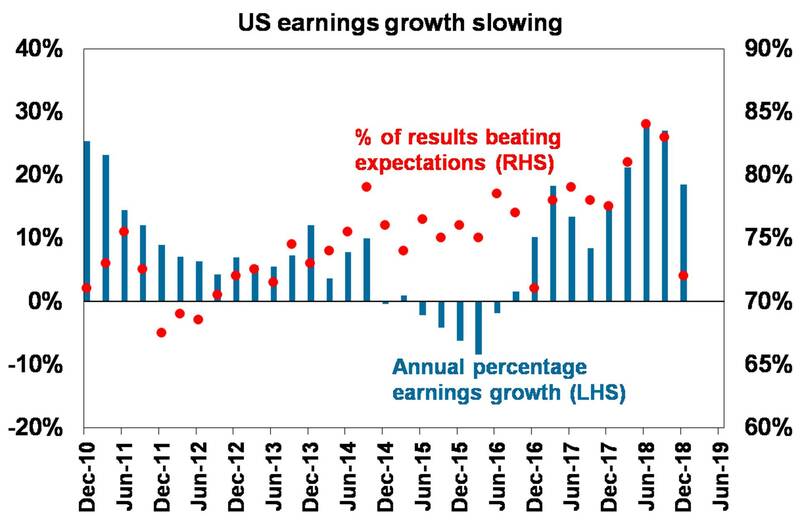 US earnings growth is likely to be around 5% this year as the boost from the corporate tax cut drops out. At last some good news out of the Eurozone with the composite business conditions PMI for February up 0.4pts after falling through much of the last year. Manufacturing conditions fell further but this was offset by the more important services sector. In Germany the IFO business conditions survey for February continued to fall. Pressure remains on the ECB to provide more cheap bank financing which looks likely to be announced next month. The news out of Japan wasn’t so good though with a sharp fall in the manufacturing conditions PMI for February and soft data for machine orders, machine tool orders, exports and imports. Core inflation in February remained weak at 0.4% year on year. Australian data was a mixed bag with another strong jobs report, but wages growth still stuck at a low 2.3% year on year (or 2% were it not for the faster increase in the minimum wage) and a further decline in the CBA’s business conditions PMIs for February with very weak service sector conditions. There is no doubt that jobs growth has been and remains strong. But assessments show that it will slow going forward in response to reduced housing construction and soft consumer spending on the back of falling house prices resulting in an increase in unemployment and lower for longer inflation ultimatley providing the trigger for rate cuts later this year, starting in August (but they could come earlier). Speaking of rate cuts, RBA Governor Lowe’s parliamentary testimony and the minutes from the RBA’s last meeting didn’t provide a lot that was new – really just confirming the shift to a neutral bias on interest rates. But the minutes did further elevate the importance of house prices in relation to the RBA’s thinking on rates with the observation that if house prices were to fall “much further” it would likely drive a downwards revision to its growth and inflation forecasts and an upwards revision to its unemployment forecasts. 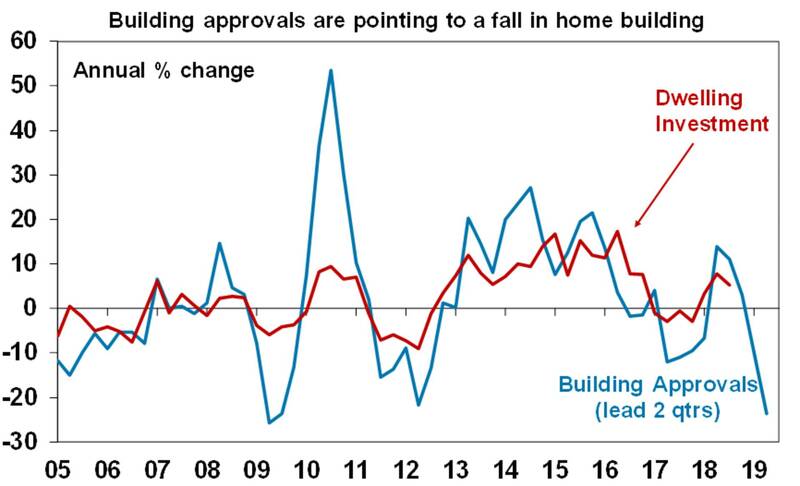 So while the RBA has not been too fussed with the house price falls to date, it’s signalling that it will get a lot more concerned (read rate cuts) if (as expected) house prices continue to fall. 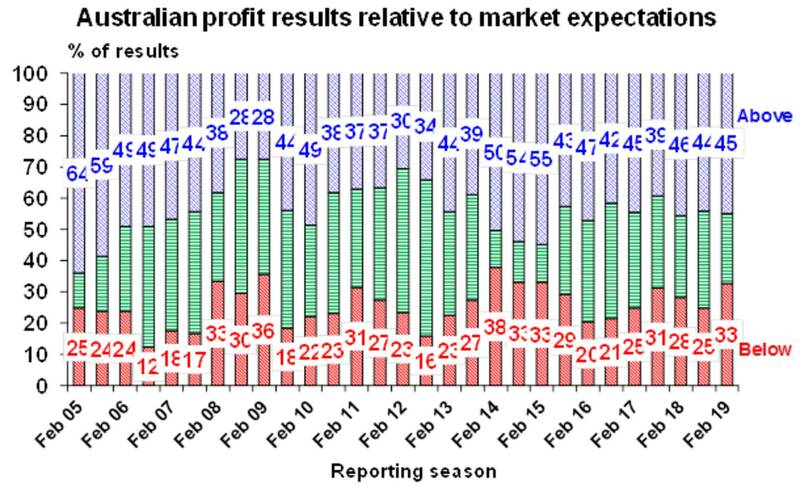 The Australian December half earnings reporting season has been better than feared but shows a slowdown in underlying growth, caution regarding the domestic outlook but an overall upgrade in earnings growth expectations thanks to resources stocks. 75% of companies have now reported. 56% of companies have seen their share price outperform on the day of reporting (which is above a longer term norm of 54%) but against this only 40% have surprised analyst expectations on the upside which is below the long run average of 44%, 34% have surprised on the downside which is above the long run average of 25%, the proportion of companies seeing profits up from a year ago has fallen and only 59% have raised their dividends which is a sign of reduced confidence in the outlook six months ago it was running at 77%. Concern remains most intense around the housing downturn and consumer spending. While 2018-19 consensus earnings growth expectations for this financial year have slipped to 1% for the market excluding resources they have been upgraded to 14% for resources stocks as the higher iron ore price gets factored in. So earnings growth expecations for the market as a whole have been revised up to 5% from 4.3% a month ago. While several cashed up companies announced higher dividends ahead of Labor’s proposed franking credit cutback, overall dividend upgrades have fallen. In the US, expect a bounce back in February consumer confidence, continued modest gains in home prices but a slight fall in January housing starts (all due Tuesday), December quarter GDP growth (Thursday) to show a slowdown to 2% annualised growth and the February manufacturing conditions ISM index (Friday) to slow to around 56. The core private consumption measure of inflation for December (also due Friday) is expected to remain unchanged at 1.9% year on year. Meanwhile Congressional testimony by Fed Chair Powell on Tuesday is likely to confirm that the Fed remains patiently on hold regarding interest rates and flexible regarding its quantitative tightening program. Eurozone data is expected to show unemployment remaining unchanged at 7.9% in January and core inflation for February (both due Friday) remaining around 1.1%yoy. Economic confidence data for February is due Thursday. Japanese industrial production data for January (Thursday) is expected rise slightly and labour market data (Friday) is expected to remain strong helped by the declining workforce. Chinese business conditions PMIs for February (due Thursday and Friday) are expected to show continuing softness in manufacturing but solid services sector conditions. In Australia, December quarter construction data (Wednesday) is expected to show a 0.7% gain, December quarter private investment data (Thursday) is expected to rise 0.8% with capex intentions also improving slightly, credit growth (also Thursday) is likely to have remained moderate in January and CoreLogic house price data for February (Friday) is expected to show a further decline. The Australian December half earnings results season will conclude with 43 major companies reporting including Boral, Lendlease and QBE (Monday), Caltex (Tuesday), RIO Tinto and Seek (Wednesday), and Ramsay Health Care (Thursday). Shares are likely to see volatility remain high with a high risk of a short term pull back, but valuations are okay, and reasonable growth and profits should support decent gains through 2019 as a whole helped by more policy stimulus in China and Europe and the Fed pausing. National capital city house prices are expected to fall another 5-10% this year led again by 15% or so price falls in Sydney and Melbourne on the back of tight credit, rising supply, reduced foreign demand, price falls feeding on themselves and uncertainty around the impact of tax changes under a Labor Government. Global share markets rose over the last week helped by optimism on US/China trade talks, progress towards averting a renewed partial government shutdown in the US along with okay earnings results. Australian shares were little changed having outperformed sharply in the previous. Bond yields were little changed. The oil price rose but metal and iron ore prices fell. The $A was little changed as the $US rose. Progress in US/China trade talks and the (likely) avoidance of a return to the partial government shutdown in the US are both positive to the extent that they help dial down the political risk that weighed on investors last year. If the March 1 tariff deadline is delayed it’s likely that the US auto tariff threat will also be delayed as Trump has been inclined to avoid multiple battles at once. Avoiding a return to the shutdown even if Trump goes down the contentious path of declaring a National Emergency to get Wall funding – is good news as it removes a threat to the economy and adds a bit to confidence that a debilitating battle over the need to raise the debt ceiling from March will be avoided. Some lessening in political threats (for now) along with a swing to more dovish/stimulatory economic policy globally are consistent with views that this year will be a decent year for share markets. However, with share markets having run hard from their December lows and technically overbought and economic data still weak the risk of a short term pull back is high. 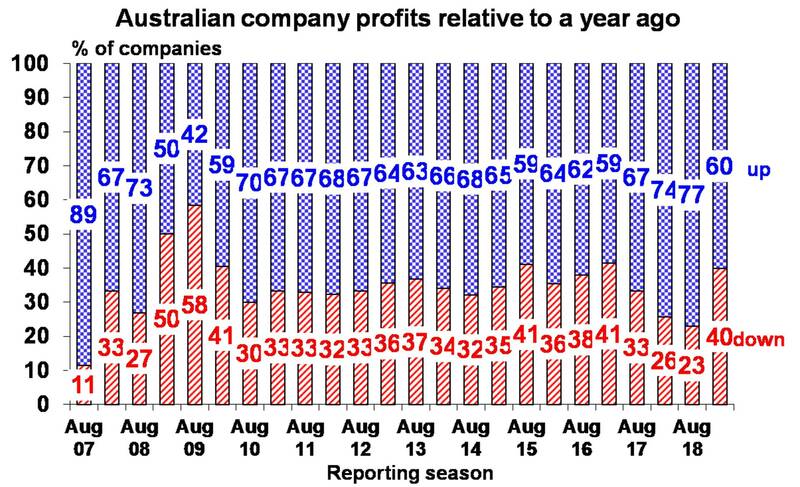 The Australian share market particularly looks to have run ahead of itself. Earnings results have been better than feared but economic growth looks to be slowing, the earnings outlook is constrained, and RBA rate cuts are still a way off. US data was messy over the last week. Retail sales fell sharply in December possibly reflecting the impact of the shutdown and share market falls at the time, small business confidence continued to fall and jobless claims rose continuing a rising trend. Against this, job openings and hiring were all strong. Meanwhile, headline inflation was weak thanks to falling energy prices, but core inflation was flat at 2.2% year on year and with momentum accelerating again. The weakness in retail sales is consistent with the Fed pausing, but the acceleration in core CPI inflation in recent month means that it’s premature to conclude that the Fed has finished tightening for this cycle. Expect the Fed to be on hold for the next six months with maybe one hike later this year. The US December quarter earnings reporting season continued to surprise on the upside over the past week, but its still showing a slowdown from previous quarters as the tax boost and underlying earnings growth has slowed. 80% of S&P 500 companies have now reported with 72% beating on earnings with an average beat of 3.3% and 60% beating on sales. Earnings growth is running at 18.5% year on year for the quarter. As can be seen in the next chart the level of surprises and earnings growth is slowing down. US earnings growth is likely to be around 5% this year. Eurozone December quarter GDP growth was confirmed at 0.2% quarter on quarter or 1.2% year on year. Germany just missed out on falling into a technical recession with growth of just 0.02% qoq. Pressure on the ECB and the German government for more stimulus is intensifying. Japan’s economy grew again in the December quarter after a natural disaster affected September quarter. But GDP is flat on a year ago. That said inventory, trade and public investment were the drags on growth and consumption & investment were solid. The BoJ will still have to keep the pedal to the metal. Chinese exports and imports bounced back in January suggesting that things aren’t as bad as feared. That said it would be wrong to get too excited either way as the Lunar New Year holiday is known to distort Chinese data around this time of year. Meanwhile inflation continued to fall in January. After weeks of poor data, Australian data was mixed over the last week. On the positive side the NAB survey measure of business conditions and consumer confidence bounced back in January and February respectively although both remain at uninspiring levels. Pressure remains on the housing market though with housing finance sliding sharply in January, reports that China has moved to make it even tougher for its citizens to move money out of China destined for property markets in Australia and elsewhere and ASIC moving to toughen up its regulatory guidance to lenders to the effect that Household Expenditure Measure benchmarks are too low an estimate of borrowers’ living expenses and that actual verification of income is required. In terms of the latter while many lenders have already moved in this direction its likely that there is still further to go in terms of tightening up lending standards. The Australian December half earnings reporting season has been better than feared but shows a slowdown in growth and caution regarding the outlook. So far about a third of results have been released. 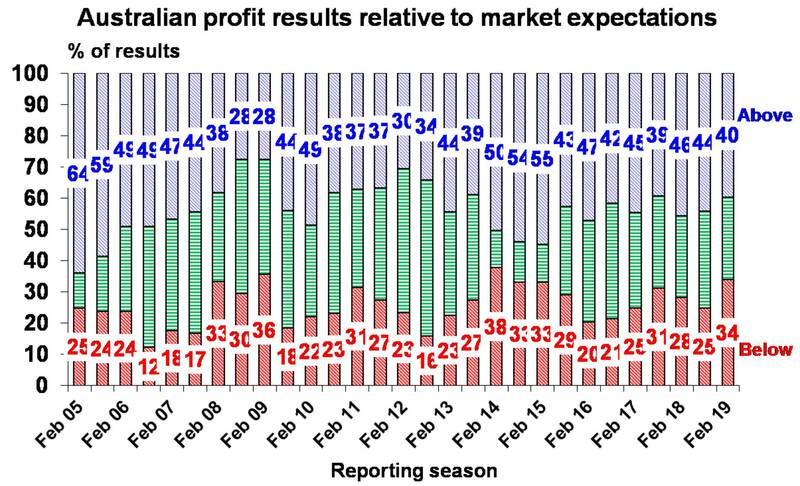 60% of companies have seen their share price outperform on the day of reporting (which is above a longer term norm of 54%) and 45% have surprised analyst expectations on the upside which is around the long term average, but a more than normal 33% have surprised on the downside, the proportion of companies seeing profits up from a year ago has fallen and only 55% have raised their dividends which is a sign of reduced confidence in the outlook – six months ago it was running at 77%. Concern remains most intense around the housing downturn and consumer spending. In the US, expect the minutes from the Fed’s last meeting (Thursday) to confirm that the Fed remains upbeat but that it is waiting patiently to decide what to do next in terms of interest rates and that it might end its quantitative tightening process earlier than previously expected. On the data front expect a slight rise in the National Association of Homebuilders’ conditions index (Tuesday), a modest rebound in underlying durable goods orders, business conditions PMIs for February to remain around 54-55 and existing home sales (all due Thursday) to rise slightly. In the Eurozone the focus will be on whether the business conditions PMIs (Thursday) show signs of trying to stabilise after falling through most of last year or continue to fall. Japanese inflation data for January is expected to show core inflation rising slightly but only to 0.4% year on year. In Australia the minutes from the last RBA board meeting (Tuesday) will confirm the shift to a neutral bias in terms of the immediate outlook for interest rates and Governor Lowe’s parliamentary testimony on Friday will be watched for further clues in terms of how the RBA is seeing the outlook for the economy. On the data front expect December quarter wages growth (Wednesday) to hold around 0.6% quarter on quarter or 2.3% year on year as the lift in the minimum wage increase to 3.5% continues to feed through. January jobs data is expected to show a 5000 gain in employment and a rise in unemployment to 5.1%. Data for skilled vacancies and the February CBA business conditions PMIs will also be released. 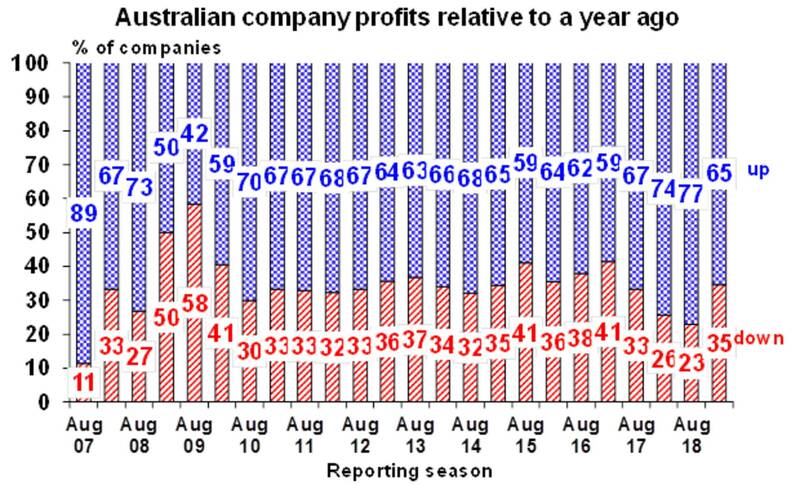 The Australian December half earnings results season will see its busiest week with 70 major companies reporting including Ansell, Brambles and Coles (Monday), BHP, Bluescope and Cochlear (Tuesday), Fortescue, Stockland, Seven Group and Woolworths (Wednesday), and Coca-Cola Amatil, Nine and Wesfarmers (Thursday). 2018-19 consensus earnings growth expectations are around 4% for the market as a whole. Resources, building materials, insurance and healthcare look to be the strongest with telcos, discretionary retail, media and transport the weakest and banks constrained. Shares are likely to see volatility remain high with the high risk of a short term pull back, but valuations are okay, and reasonable growth and profits should support decent gains through 2019 as a whole helped by more policy stimulus in China and Europe and the Fed pausing. Our view on global and Australian share markets hasn’t changed. They have run hard and fast since their December lows and some sort of short-term pull back is likely. There are plenty of potential triggers for a pull-back including ongoing trade uncertainty (both between the US and China, but also with Trump still threatening auto tariffs on the European Union); a risk of a resumption of the shutdown in the US; and ongoing soft economic data globally, most notably in Europe over the past week. Australian shares look to have run too-far-too-fast as economic growth looks to be slowing and while it is expected that the RBA will cut rates, it’s probably still a way off. RBA downgrades the outlook and moves to a neutral bias on interest rates. In the past week the RBA acknowledged increased downside risks globally and in Australia, and its Statement on Monetary Policy revised down its Australian growth and inflation forecasts. Consistent with this, it has dropped its mild-tightening bias (the mantra that the next move in the cash rate is ‘more likely to be an increase than a decrease’) and replaced it with a neutral bias, ie the next move could be up or down. It is likely the RBA’s downwardly revised growth forecasts for 3% this year and 2.75% next year are still too optimistic, and it is likely to be closer to 2.5% at most as the housing downturn depresses housing construction and consumer spending. This in turn will mean that inflation will stay even lower for longer than the RBA is forecasting. We continue to see the RBA cutting the cash rate this year and it’s now moving in this direction, but there is still a way to go yet. In the absence of a significant negative shock, this was never going to happen over night, but would occur as part of a process starting with the RBA revising down its forecasts (done); moving to a neutral bias on rates (done); more downwards revisions to its forecasts; moving to an easing bias; and then easing. It’s likely this will require several more months of soft data and the RBA is likely to prefer to see what sort of tax cuts/fiscal stimulus will flow from the upcoming April Budget and the outcome of the election. So they will likely prefer to wait until after the budget and election. Which is why it is thought the first easing is likely to be around August, but it could come as early as June. View remains that the cash rate will be cut to 1% by year end in two moves of 0.25% each. Eurozone data continues to weaken, with falls in German factory orders and German and Spanish industrial production, and the European Commission revising down its growth forecasts. While the European Central Bank may be dithering as to what to do next, views remain that another round of cheap bank financing (LTRO) is on the way soon. In the US, it’s going to be ‘back to politics’ to see whether Trump and the Democrats can resolve their squabble over ‘the Wall’ and avoid a restart of the government shutdown from Friday – it appears that Congressional negotiators are making progress on a compromise, but it will come down to whether Trump will accept it. Meanwhile, US Treasury Secretary Mnuchin and Trade Representative Lighthizer will be in Beijing for another round of trade talks, with the March 1 deadline for the talks likely to be extended until Presidents Trump and Xi next meet. The focus may also shift to auto tariffs, with the Commerce Department’s auto tariff report due by Sunday. On the data front, expect core Consumer Price Index inflation for January (Wednesday) to fall slightly to 2.1% year-on-year, December retail sales (Thursday) to show reasonable underlying growth, and industrial production (Friday) to show a reasonable gain. Data on small business confidence, job openings and the New York regional manufacturing conditions survey will also be released. It will also be another busy week in the US earnings reporting season.